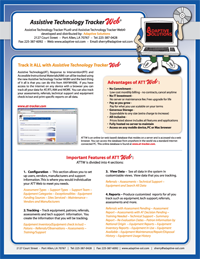 Track it ALL with ATT Web©! ATTW is a web based database that resides on a server and is accessed via a web browser. You can access the database from anywhere in the world via a standard internet connected PC. This online database is found at www.at-tracker.com. 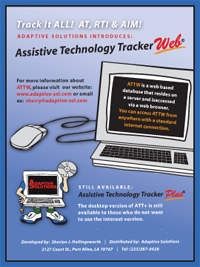 Assistive Technology(AT), Response to Intervention(RTI) and Accessible Instructional Materials (AIM) can all be tracked using the new Assistive Technology Tracker WEB© and the best thing of it all is that you can do this from ANYWHERE. If you have access to the internet on any device with a browser you can track all your data for AT, RTI, AIM and MORE. You can also track your assessments, referrals, technical support and equipment check in/out and print specific reports on all data. This section allows you to set up users, vendors, manufacturers and support information. This is where you would individualize your ATT Web to meet you needs. 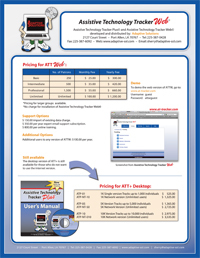 Track equipment, patrons, referrals, assessments and tech support information. You create the information that you will be tracking. See all data in the system in customizable views. View data that you are tracking. Produce customized reports for all you track such as equipment, tech support, referrals, assessments and more.